Beach bars in the British Virgin Islands are almost indescribable; they rest on the world’s most beautiful beaches, and each offer a totally different experience. Some get wild, some are family friendly, and some are totally laid back, with a “come as you are, stay as long as you want” attitude. The reigning, undisputed champion in the laid back bars category is definitely Ivan’s Stress Free Bar and Campground. Ivan’s unofficially opened for business when the easygoing and gregarious Ivan Chinnery left a cooler with beers alongside the legendary “small box and note pad,” effectively making Ivan’s an “honor bar.” Visitors were trusted to get behind the bar and serve themselves, recording their drinks on a notepad. On the way out of the bar, you just drop payment in the bucket and go on your way. 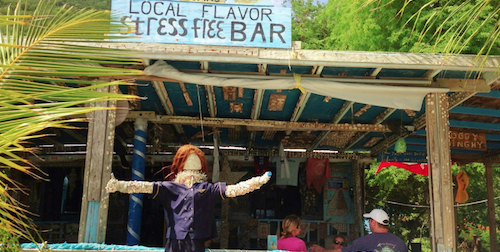 Thanks to country superstar Kenny Chesney, who filmed his “No Shoes, No Shirt, No Problems” video at Ivan’s Stress Free Bar, the popularity of Ivan’s stress-free lifestyle continues to draw crowds from near and far. Around the bar is a campground featuring electricity, a public phone, food, water, a community style kitchen and sleeping quarters where you can sleep off your rum induced haze. From basic tents to guest houses, Ivan’s holds about 100 people overnight. You can stay for an afternoon, a week, or a month. A seventh-generation native of Jost Van Dyke, Ivan Chinnery is a world renowned musician and is said to be the island’s top guitar player. Ivan plays at the bar with some of his regulars, including Kenny Chesney, Jimmy Buffet and Keith Richards. In fact, Kenny Chesney even hosted Ivan on stage during several of his sold-out concerts in the US. A true musician himself, Ivan started the “Ever Changing International All-Star Band,” wherein local and visiting musicians get together for jam sessions on random weeknights and almost every weekend–the coolest part is that you never know who will join him on stage! 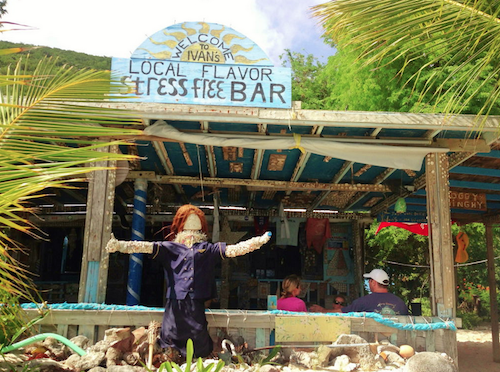 Truly, there’s no place more welcoming than Ivan’s Stress Free Bar. Spend a day or a month, and leave all your worries on the shore.